Sturdy storage, ready for duty. 11" x 5.5" x 10"h., 6 lbs. All metal construction with waterproof and airtight gasket to keep gear safe from rain, moisture, and dust. Rock solid storage for range gear, emergency supplies, documents, or other equipment. 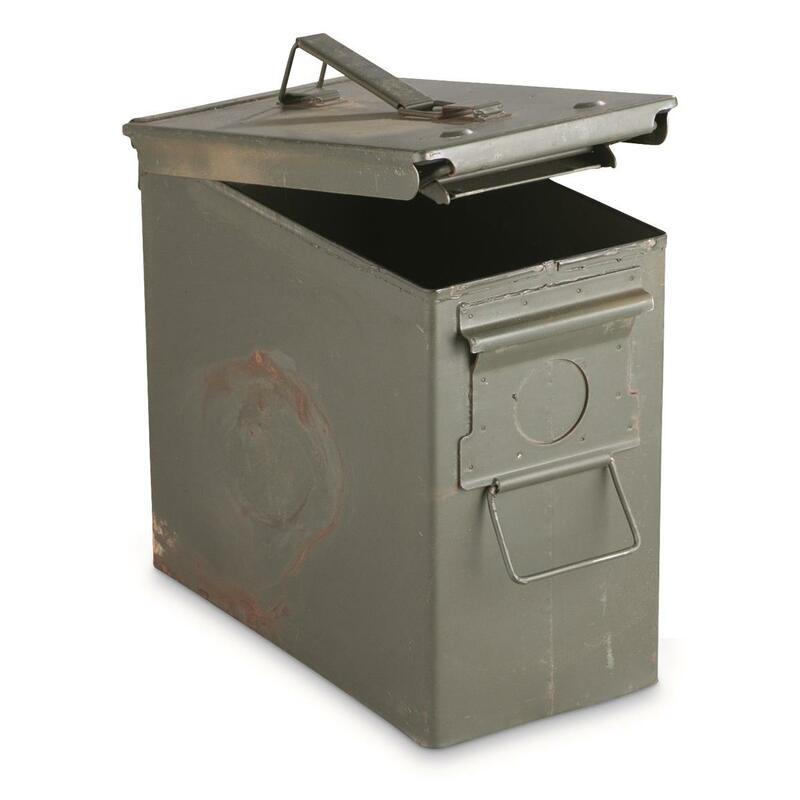 Dimensions: 11" x 5.5" x 10"h.
U.S. Military Surplus PA19 Tall .50 Cal Ammo Can, Used is rated 3.8 out of 5 by 5. Rated 2 out of 5 by notnalc from This one is was in rough shape. A little pricey, for the shape it was in. No dents, but really rusty. I've worked for an hour, sanding it down to repaint. I expected more, at double the price of a fat 50. The fat 50 I bought, at the same time, was in good shape. Rated 3 out of 5 by PAUL from A fair amount of wear and tear on the one I received. Decent quality and decent value. Rated 4 out of 5 by HENRY SCOTT from These are the perfect size can for 12 gauge ammo - skip the "Fat 50's" and go for the "Tall 50's". I got two this time (along with 4 regular .50 cal cans). One of them, however, was fairly badly rusted. It cleaned up okay, but took a lot of work. The other was in "near new" shape. Surplus means some variability, tho' I think SG might have wanted to not send out the rusty one. It really wasn't up to their usual standards, even if it, ultimately, was both salvageable and servicable. Rated 5 out of 5 by JAMES from Nice. Never saw these tall 50 cal. cans before. They are perfect for my ammo can collection (50+). I may order more. Moisture-resistant protection for ammo, parts and collectibles. 7.4"l. x 13.5"w. x 8.5"h.
18" x 18" x 24"h., 38 lbs. Smart storage and transport for up to 15 mags.